As we grow older, we lose strength and muscle mass. However, the cause of age-related muscle weakness and atrophy has remained a mystery. In their latest study, Adams’ team found that ursolic acid and tomatidine dramatically reduce age-related muscle weakness and atrophy in mice. Elderly mice with age-related muscle weakness and atrophy were fed diets lacking or containing either 0.27 percent ursolic acid, or 0.05 percent tomatidine for two months. The scientists found that both compounds increased muscle mass by 10 percent, and more importantly, increased muscle quality, or strength, by 30 percent. The sizes of these effects suggest that the compounds largely restored muscle mass and strength to young adult levels. Adams’ team investigated the molecular effects of ursolic acid and tomatidine in aged skeletal muscle. They found that both compounds turn off a group of genes that are turned on by the transcription factor ATF4. This led them to engineer and study a new strain of mice that lack ATF4 in skeletal muscle. Like old muscles that were treated with ursolic acid and tomatidine, old muscles lacking ATF4 were resistant to the effects of aging. 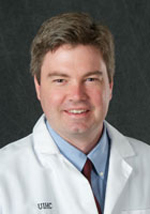 “By reducing ATF4 activity, ursolic acid and tomatidine allow skeletal muscle to recover from effects of aging,” says Adams, who also is a member of the Fraternal Order of Eagles Diabetes Research Center and the Pappajohn Biomedical Institute, and is a staff physician with the Iowa City Veterans Affairs Medical Center. The study was funded by a Small Business Innovation Research (SBIR) grant to Emmyon, Inc. from the National Institute on Aging, as well as grants from the Department of Veterans Affairs and the Fraternal Order of Eagles Diabetes Research Center at the UI.